Anaheim Manufacturing Company (AMC) disposers are the most environmentally responsible units on the market today. A lot of thought has gone into reducing energy consumption not only by the unit itself when operating but in constructing it in the first place. Such thinking extends to the packaging materials used and final product weight too. AMCʼs disposer grind food waste into much smaller particles than the leading competitorʼs disposer. In this test virtually all ground food from the AMC disposer passed through the 1/4” sieve while almost half of the ground food from the leading competitor’s disposer remained in the 1/4” sieve. That’s a 99% finer grind. Smaller food particle biodegrade faster than larger particles, keeping cesspools and drain pipes cleaner. Larger food particles can tend to clog drain pipes faster than smaller particles. Whilst they deliver a finer grind than the competition they do it with a lot less energy – in fact a massive 60% less! 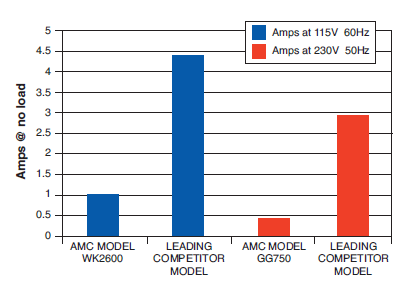 Yes AMC disposers consume less energy to grind the same food waste as the leading competitorʼs disposers. 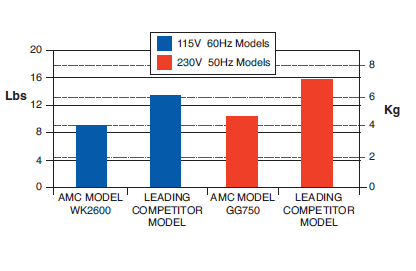 The reason for the significant increase in energy consumption of the leading competitor model is that at 50Hz the induction motor speed is reduced by 16.7% while the AMC permanent magnet motors are virtually not effected by the 50/60Hz current difference (a permanent magnet motor becomes slightly more efficient at 50Hz). 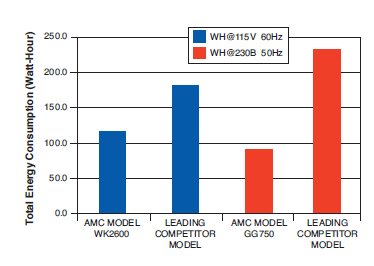 No load current draw is how much current is taken by the motor when running without anything to grind. 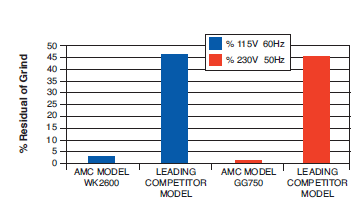 This chart indicates the relative efficiency of AMC’s permanent magnet motors compared to the leading competitor’s induction motors. Similar condition apply to all operating modes of the disposers. 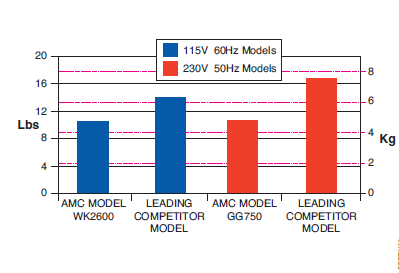 Less energy is consumed to build the permanent magnet motors used by AMC than an induction motor by the leading competitor. This is reflected in the weights of the products. Less energy is consumed in manufacturing and shipping the materials used by the AMC Waste King product compared to the leading competitors, again reflected in the total shipping weight of the products including materials. 26 Year Old Waste King!